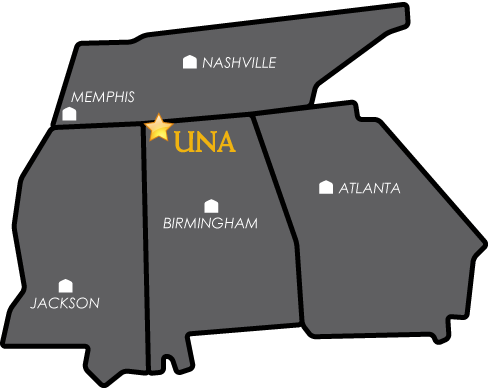 FLORENCE, Ala. – Members of the University of North Alabama Board of Trustees have decided to honor two alumni by naming two buildings on campus after them. The University Commons will now be known as the Wendell W. Gunn University Commons in honor of Wendell Wilkie Gunn ’65. In addition, the UNA Science and Technology building will become the Mitchell Burford Science and Technology Building, in honor of Dr. A. Mitchell Burford Jr. ’51. Gunn holds the distinction as being the first African-American student to enroll at the University of North Alabama under its predecessor name of Florence State College. After graduation, Gunn had a prestigious career with many personal and professional achievements in science, finance, politics, and as an independent business owner. Burford, who passed away in March, held a deep affection for UNA during his long andprestigious career in the medical field. He also holds the distinction of being the University’s largest individual private donor to date, with total gifts totaling more than $4 million. Events related to renaming the buildings will take place in 2018.